Wishing you accidental table scraps and lots of squeaky toys on this great Fourth of July! Today Charlie and I had a visit from my friend Ron, his wife Michelle and their new baby. While I was excited to meet their new addition, Charlie disappeared behind the coffee table. Matt and I experienced his fear of people a few times already, and didn’t know what to make of it. Charlie even shivers when he’s around Matt’s sweet grandma. Since we are not behaviorists, we’re not quite sure what to do. So Charlie hid behind the table, and lifted his head once to let out a tentative “Woof!” before ducking down again. I picked him up and let my friends pet him, but I could tell he was still freaked out by it all. In the evening we’ve been taking him for walks, in hopes of meeting neighbors out on their lawns who might be up for petting a cute puppy. So far, it’s been hit-or-miss. I’m sure all of this has been hard for Charlie to take in. His humble and terrifying beginnings at a Kentucky shelter, his rescue and eventual adoption that brought him to Michigan. It’s a lot for anyone to go through, let alone a lil puppy. It’s a coin toss if Charlie will take to you. Some people he loves, others he hides from or he cries. I imagine he has trust and abandonment issues that I’ll never quite comprehend. Learning to peel back these layers is a lesson in patience … and compassion. I must say Charlie is gentle, and loving and the best puppy I could ask for. He loves Lexie above anything else, and listens to us extremely well. He just is super shy around some people. He is young, and I figure much of this will sort itself out on its own. We plan on taking Charlie to our family barbecue today, and hope more social time will help him. 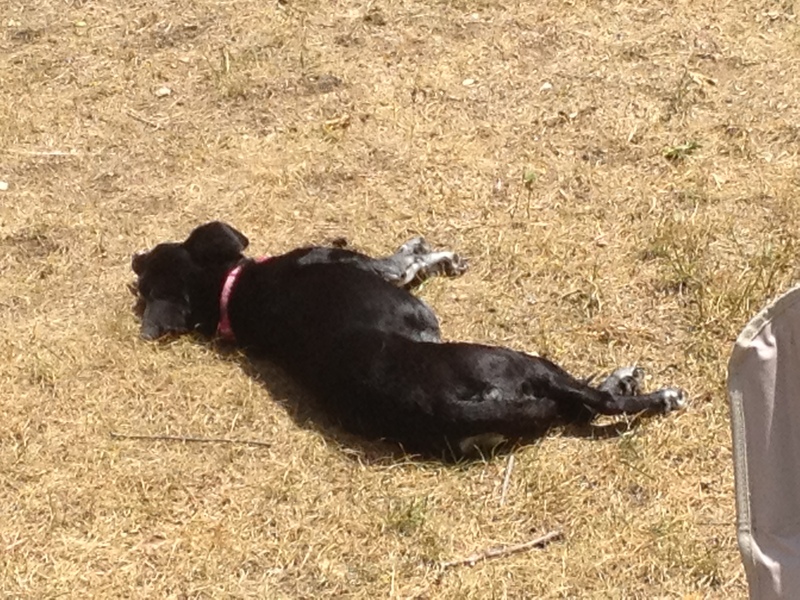 We’re leaving Lex behind, so she can have some puppy-free time and stretch out in the sun. Puppy-free afternoon? Sheesh, I’m taking a nap in this crazy heat. This entry was posted in Woof! 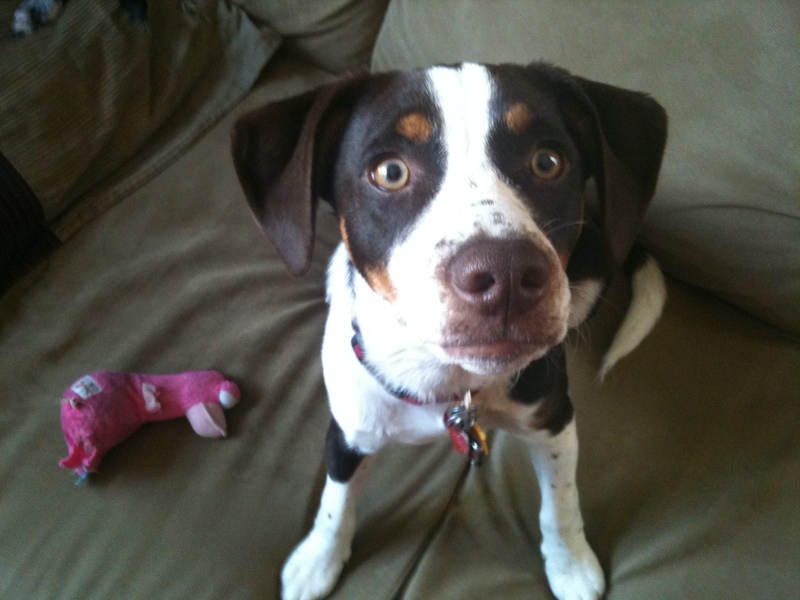 and tagged adopt, dog, kentucky, michigan, puppy, rescue by ourfureverfamily. Bookmark the permalink. Have you told him some really bad news? what a face! I relate to this problem a lot, Doggy doesn’t like anyone, not a single person up to this very day, he tolerates kids but he doesn’t like people petting him nor getting to close, however, with Doggy what’s behind is more a matter of his breed, all these dogs are very wary of strangers, he shows curiosity, approaches and then moves away. I’ve asked and all I can do so far is the same you are doing, socializing as much as possible and do not force him to let people pet him, “force” him to be around people and he’ll improve, Doggy has. He’s the cutest thing! Awwe! I think you are right, that consistent socialization should help. Charlie survived a family barbecue yesterday. At first he was overwhelmed, but we made sure to not make a big deal of it. Eventually he came out of his shell a bit, and even let some people pet him. He enjoyed making friends with two dogs. Overall, it felt like a succss.